I’m with my entire family and just met my adorable 7-month-old great-niece for the first time. We don’t need to find “things to do” this weekend because watching the baby and my 2-year-old twin great-nieces is so entertaining–and exhausting. Here’s one of the secrets to partnering with a large company or nonprofit. They can pay your PR costs and give you exposure far beyond what a $20,000 publicist might be able to do for you. That’s because many of them have giant marketing budgets, their lengthy email lists, consumer research you don’t have at your fingertips, and savvy marketing staffs. And if you’re an author, speaker or expert, you probably have a ready–made audience-–or the beginnings of one–that will be enticing to a sponsor. Why do they need you? Because they can reach only so many people. If your audience is THEIR audience, they might want someone like you–who your fans already know, like and trust–to promote their brand. During free training at 2 and 7 p.m. today, Saturday, Oct. 28, Steve Harrison will interview an author/speaker who’s landed sponsorships with FedEx, Bank of America, Microsoft, Walmart, Dun & Bradstreet, Wells Fargo and many other companies and organizations. You’ll learn the 14 subject categories for authors and speakers who attract sponsors, fatal mistakes to avoid when approaching sponsors, the five most important elements of a sponsorship proposal, and the exact amounts of money you should ask for (most people ask for too little). If you’ve already tried to get a sponsor but you made one of two mistakes, the special guest will explain how to fix it and try again. To do: Register for “The Top 5 Ways to Attract Corporate Sponsors-–Even if You’re Just Starting Out” using my affiliate link. Promoting your expertise in a topic remains one of the best ways to generate publicity. 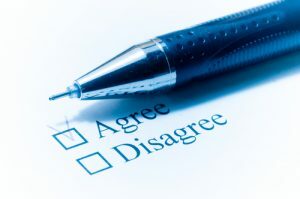 Surveys, which show people’s opinions and reactions to topics tied to your expertise, are also publicity magnets. The media love reporting on surveys because they’re easy stories to write. Andrew Blum of AJB Communications recommends you have not only a press release or a PR pitch ready, but also a copy of the full survey or study to offer the media. To do: Read his other tips, including his caution about offering exclusivity, in the article for PR pros on “A smart way to get your client in the news: surveys and studies.” Then, think about a controversial, entertaining or educational topic tied to your expertise, and survey your followers. If you have enough money, there’s a third and better alternative. Do both. A publicist can concentrate on top-tier media while you go after lower-level publicity opportunities. Just make sure she knows exactly what you’re doing so you don’t step on her toes. Book publicist Jane Tabachnick likes that option. I do too. 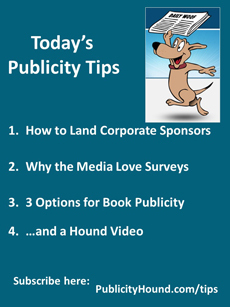 To do: Read her article “3 Ways to Get Publicity for Your Book,” which outlines the pros and cons of the three options. 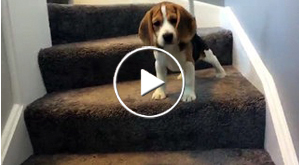 Oliver the beagle puppy has a hard time going down stairs. He makes cute noises and then has a surprise for the ending. Joan, thank you for including my guest post from The Book Designer!! So happy to be able to share it with my readers, Jane.